Liverpool City Council provides safe spaces for all rough sleepers in the city. Labre House is a night hub open from 8pm to 8am, 365 days of the year and provides a safe and warm environment for the city’s rough sleepers. 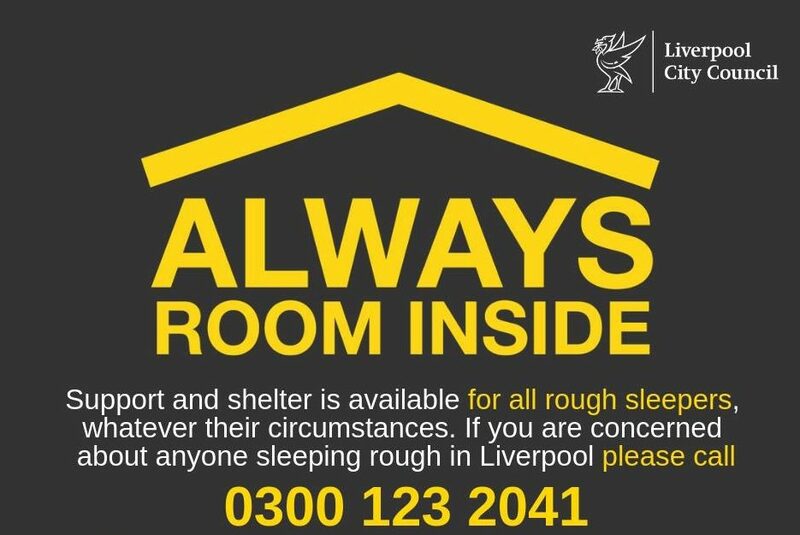 Always Room Inside is the initiative set up by Liverpool City Council to provide safe access to all rough sleepers in the city, regardless of their circumstances. If you would normally be sleeping rough for the night, just turn up at the shelter on Camden Street, and the staff and volunteers will help you. Any rough sleeper will get help and we won’t turn anyone away – not even your dog. Whatever your circumstances, there’s always room inside. LHFC is a not for profit community interest company that has operated successfully across the regional & national homeless sector since 2007. The club uses sport in particular football (but not exclusively), to engage with marginalised men and women from across Merseyside who are affected or experiencing homelessness or are likely to in the future without intervention. The core service that LHFC offers is the delivery of sporting activities for the people who live in the Merseyside area (all year round) that are free and easy to access in a secure, safe environment. One of the main social aims is to improve the physical and mental wellbeing of our participants. If you know anyone who is a rough sleeper, then please advise them to go to Labre House to get help. If you believe that they could benefit from engaging with LHFC, then please advise them to get in touch with us, or you let us know so that we may engage with them, thank you.